Looking for a Place to Fit In? 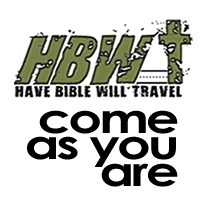 Have Bible Will Travel is the place for You! From the time you walk in the door you will notice something different about HBWT – Joy & Acceptance. We love Jesus and want to share what He has done in our lives. Our mission is to carry out the Great Commission, which the Lord commands, and guide people, of all backgrounds, into a personal relationship with Jesus Christ. We have a relaxed and authentic atmosphere with a “No shoes - No suit – No problem ” attitude. So, if you’re looking for a bible teaching, Spirit filled church that loves Jesus, loves people and loves this country then come check us out. Services - Saturday 7:30pm Sunday 9:00am, 10:30am & 11:00am Bible Studies Galore & Many Ministries for all ages. If you’re looking for a bible teaching, Spirit filled church that loves Jesus, loves people and loves this country then come check us out.